Hillsboro City Council discusses business items at its monthly meeting Tuesday. Following an executive session Tuesday, Hillsboro City Council voted 4-3 in favor of a resolution to join the Paint Creek Joint EMS/Fire District, but the motion did not carry because it was attempted as an emergency measure and did not receive six favorable votes. Discussion will continue at a special meeting later this month. Council, along with Mayor Drew Hastings and Safety and Service Director Mel McKenzie, spent about a half an hour in executive session during its monthly meeting Tuesday evening, and reconvened to hear a first reading on the resolution. Councilwoman Ann Morris made a motion to suspend the three-reading rule and vote on the legislation as an emergency, and when roll was called, council members Morris, Claudia Klein, Brandon Leeth and Wendy Culbreath voted yes. Council members Mary Stanforth, Justin Harsha and Adam Wilkin voted no. Council President Lee Koogler said since emergency legislation must receive six yes votes to pass, the resolution failed. Morris requested a special meeting within the next two weeks to resolve the matter before 2019 budget talks begin. Koogler said a meeting will be scheduled in coming days. The vote followed more than a year of discussion on whether the city should join the district as a member or continue utilizing its services on a contract basis. As previously reported, the legislation appeared on council’s agenda in June at the request of the Hastings administration, three months after the same resolution was nixed in March by a 5-1 roll, with Morris being the lone yes vote. Council tabled the legislation at the time, and the matter was placed in the Finance Committee for review. If the city joins the district, it would have a seat on the Paint Creek operating board, and a 5.5 mill property tax would be imposed to pay for membership, as is the case for townships that have joined the district. It has been said the increase in property tax would amount to about $170 per year for each $100,000 of valuation, though Hastings has disputed that figure. Some local residents have complained that the levy would effectively be a “double tax,” because a portion of tax revenue is used to pay for the Paint Creek contract out of the city’s General Fund. Those in favor of joining say the General Fund savings could be used to pay for infrastructure projects and other needs. The city’s current contract with Paint Creek expires at the end of the year, according to Koogler. 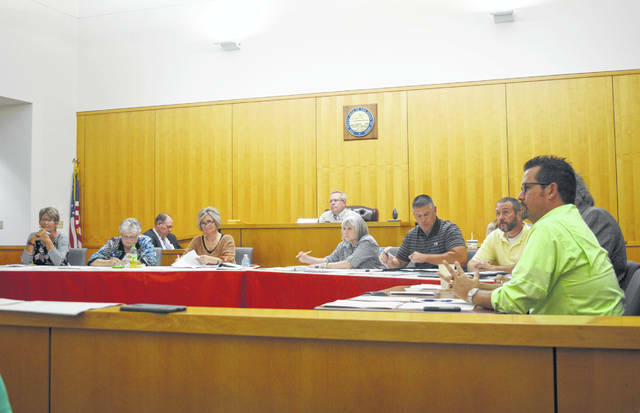 Also Tuesday, council heard a first reading of an ordinance establishing a municipal trash collection service by contract with private providers, and after several local residents and a representative of a local waste disposal company pled with legislators to scrap the idea, the matter was placed in the Utilities Committee for further review. The ordinance, introduced by Culbreath, Klein, Leeth and Morris, would authorize the safety and service director to bid out trash pickup in the city and bill residents for it. The six private companies providing trash pickup service in Hillsboro would bid for one or more of Hillsboro’s four quadrants and the city would tack the charge onto citizens’ water bills. The legislation’s sponsors say it could save citizens up to 50 percent of their bill. Morris said council members are considering including an “opt-out plan” in the ordinance for residents who want to keep their current trash provider. Stanforth said she has used Tener Trash Removal since 1969 and has always been pleased with its service. Gary Bego, a local resident, said he saw a similar ordinance approved in California, and while the bills were cut at first due to a low bid from Rumpke, the company increased its price with each new contract and caused customer’s bills to skyrocket. Bego said the ordinance would be hard on smaller local businesses because Rumpke would always present the lowest bid due to its size. Former county commissioners Tom Horst and Gary Heaton also opposed the ordinance, with Horst saying he, too, has used Tener for many years and doesn’t plan on switching companies. McKenzie said under statute the city can choose the “best and lowest” bid, which doesn’t necessarily mean going with Rumpke. The safety and service director said the lowest bid is not always the best, and the city could choose a local company. Hastings said he has “always been opposed” to choosing one large company to take out the city’s trash. When a similar idea was discussed last year, Hastings said, it was suggested that city residents could choose from a list of trash handlers as part of the plan. Morris said the ordinance was written because some residents had complained about higher utility bills and she and others wanted to offset the cost. Koogler placed the matter in the Utilities Committee for further review. Utilities Chairman Brandon Leeth said the ordinance is “just an idea” and he hopes to receive more public feedback. In other public comments, Highland County Common Pleas Judge Rocky Coss gave a presentation on State Issue 1, which he and other judges have opposed. Coss said the issue, which aims to lower incarceration rates and funnel the state’s savings into drug treatment programs, is run by out-of-state interests and will not work for Ohio. Letcher Langston, a Hillsboro resident, said he, too, is against the issue. Mike Morgan, a local business owner, complained to council that the city’s code inspector told him he must make repairs and additions to his buildings that would cost tens of thousands of dollars. Koogler said council is not in charge of enforcing building code and Morgan must continue with the inspection process. McKenzie said the inspector is willing to give leeway to building owners as long as he sees progress. In the mayor’s report, Hastings said the city is looking for ways to develop the abandoned BP station on West Main Street, and he has been in contact with Rural King about its opening date in Hillsboro. Hastings said he’s confident the store will open sometime in 2019. In the safety and service director’s report, McKenzie said park projects in the empty Colony Theatre lot and on Governor Trimble Place are coming along well. McKenzie requested council “clean up” the city code due to outdated ordinances remaining in place, review the city’s building fees, address stormwater runoff, and set a preliminary budget meeting. Koogler placed each matter in the appropriate committee for discussion. In the Hillsboro Planning Commission report, Hastings said the commission last month accepted the resignation of Ruth Robbins, discussed the “Imagine Hillsboro” master plan for the city, and talked about small-cell zoning. In the Property Maintenance and Restoration Committee report, Chairwoman Morris, requested Koogler remove the Colony Theatre park from her committee because no more legislation is required. Community Enhancement Committee Chairwoman Klein said in her report that while a parks and recreation district is not feasible for Hillsboro, the city currently has a job description for a parks and recreation director. Koogler removed the issue from Klein’s committee and asked McKenzie begin the administrative process. • Suspended the three-reading rule and approved as an emergency a resolution authorizing the city to apply for a water pollution control loan for the construction of wastewater or water facilities. • Approved a resolution to increase appropriations in the street fund to pay for an Ohio Department of Transportation paving project. • Approved a resolution authorizing the city to apply for financial assistance from the Ohio Department of Natural Resources through the Federal Land and Water Conservation Fund Program. • Suspended the three-reading rule and approved as an emergency a resolution authorizing the city to enter into an agreement with the Ohio Water Development Authority for a walkway project. • Approved a resolution transferring $40,000 to the Streets Fund. • Suspended the three-reading rule and approved as an emergency an ordinance amending animal regulations in the city zoning code.